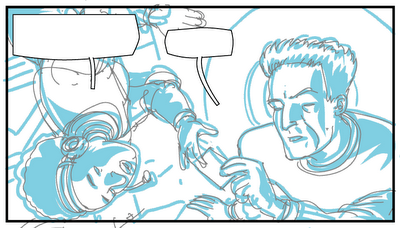 It's always struck me as funny that, on the whole, comics shy away from showing characters in zero gravity. You can understand it in film, for though modern effects have made it possible to do protracted free fall sequences (think Apollo 13 and Red Planet), it's still a budget-stretching exercise and presumably awkward to film; with comics there's no such restriction. Even so, there's been a tendency to stick with the convention of artificial gravity (a short scene in Bring Me Liberty being the only exception that leaps to mind), possibly because of a fear that the zero-gee environment would distract from the storytelling.